MUSIC: The Rose Lyric's are at the bottom of the page. You will not find this picture in the Musee de Quebec, since I have merged two pictures of my great great grandparents photographically. Many thanks to Anne Bourassa, daughter of Henri Bourassa, for these pictures. My great great grandfather Francois Bourassa and his wife Genevieve Patenaude lived in L'Acadie, and his son Vital Bourassa and his wife Emelie Hebert owned the farmhouse and 336 acres of land later. I believe that my grandfather Louis Alphonse Bourassa was born there and with his wife, Vitaline LeBlanc, raised their children in L'Acadie before moving to St Jean about 1906 and later to Winooski, Vermont in 1910. 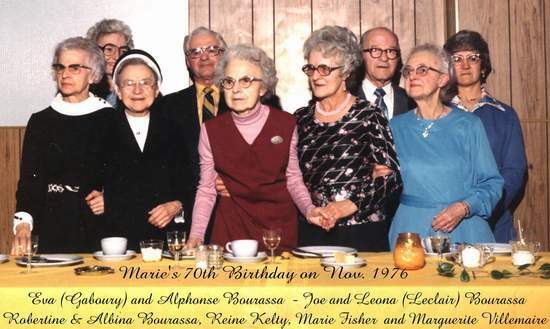 The L'Acadie Quebec Website - L'Acadie is a special place for the Bourassa and Fisher Family. It is a beautiful place to visit if you have the opportunity. Acadian and French Canadian Ancestral Home - Learn about our great Acadian History. It is a razor that leaves your soul to bleed. and you its only seed. That never learns to dance. That never takes a chance. Who cannot seem to give. In the spring becomes the rose.